Welsh quintet SKINDRED released their latest album Volume this past October via Napalm Records. The band has toured extensively throughout Europe since the release, and now they are ready to bring their unique style of "Ragga Punk Metal...wid a twist" to the States. The tour kicks off September 14th in New York, NY and runs through October 8th in Los Angeles, CA. 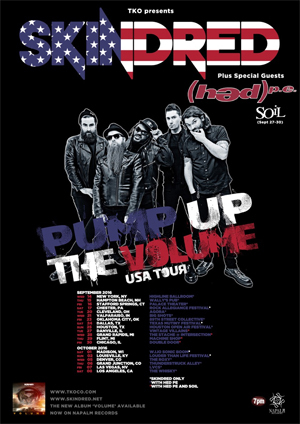 Support on select dates will come from (HED)PE and SOIL. "We come in peace but we intend to leave you in pieces! Let the mayhem commence USA USA USA. Come watch the Dred play!" Volume is available for to order at the Napalm Records Webstore HERE. Volume is the band's sixth album and first on Napalm Records. The album was recorded at The Strongroom studio in East London and was produced by longtime collaborator James 'Lerock' Loughrey (previously worked with the likes of WHIE ZOMBIE, DEPECHE MODE, MANIC STREET PREACHERS).